To Do: n/a (or maybe make anew as I loved it so much? Inspiration: Portrait of a Girl said to be Sofonisba and spanish but clearly from Italy. 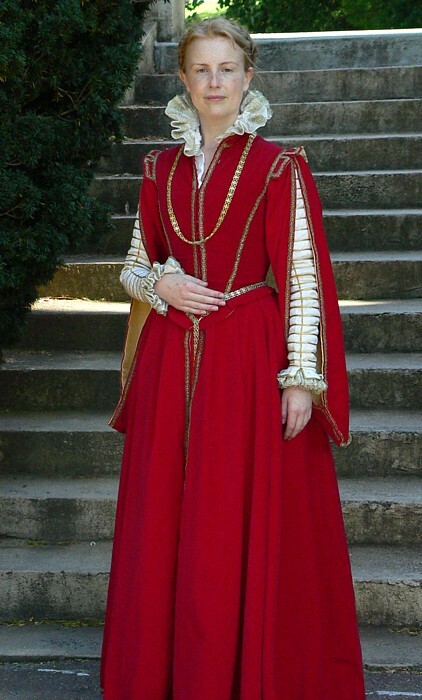 In 2008 I decided to make over my red doublet gown. I was inspired by a portrait variously attributed to Sofonisba Anguissola and Sanchez Coello and purported to be Elzabeth de Valois as a child. The portrait in question only bears a passing resemblance to Elizabeth but is in keeping with Sofonisba’s style especially the face with the roundness of cheek and eyes. Sofonisba also was very good at capturing the regional and class differences in dress so it makes little sense that she would paint Elizabeth in a gown that was neither French nor Spanish but distinctly Italian in flavour. The softly pleated skirt front is the biggest deviation from the smooth Spanish styles in this costume but also the more relaxed sleeves. It is clearly heavily influenced by Spanish court dress and so it was interesting to me. Another reason I doubt the portrait to be of Elizabeth is that though she was married by proxy at an early age to Philip she remained in France for some time and this portrait most certainly dates from her life in France.